The Topps Now program was a hit for the trading card company in it's inuagural year. 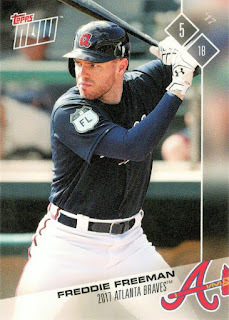 Like with any good company, Topps was looking to continue riding the success they had in 2016 with another year of product that captured events all throughout the new 2017 baseball season. This time around they decided to kick things off early with a preview set if you will, Opening Day. I didn't pay much attention to this, but I did see that Freddie Freeman received a card in the set so I searched the 'net for it. I finally found a reasonably priced card and placed my order...then the wait began. I'm still not sure what caused the long delay, but the card finally arrived in today's mail. 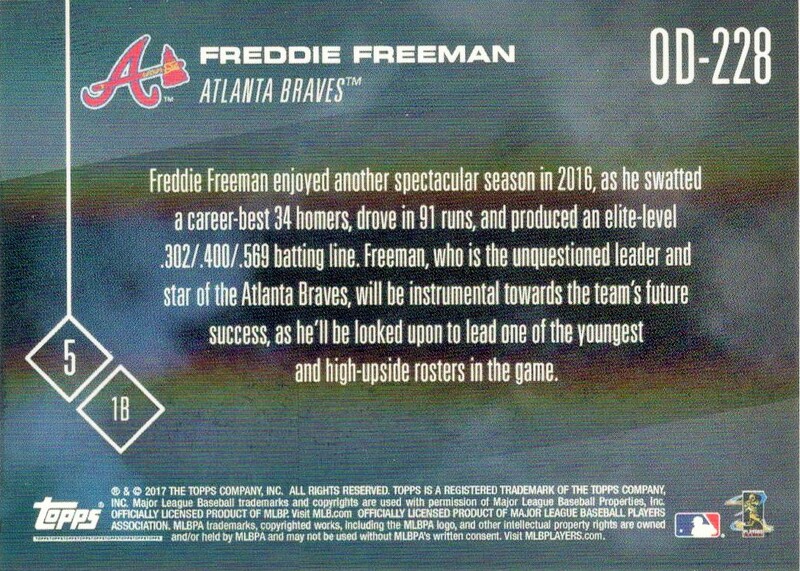 From what I can tell, this card wasn't created after any events of a Spring Training game. It just appears to be a "regular" card that just happens to sport the new 2017 Topps Now design. You really can't tell from the scan, but the back of the card has a rainbow sheen to it. It looks really nice in hand. I'm ready for another year of Topps Now. I bought just about every Braves card from last season (still working on scanning those to share) and I've got a decent jump on this year. One of the things I like that Topps has done yet again w/ this program is that you can sign up for your favorite team, pay for a certain amount of cards (at a discount) and just sit back and wait for players from your team to do something on the field to earn a 2017 Topps Now card. It makes it a lot easier if you lead a hectic life (like I do) and can't constantly check the Topps website everyday to see what cards are being offered. 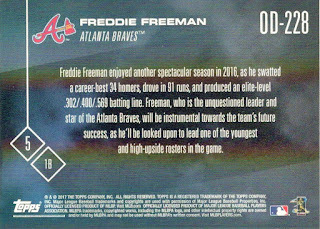 Topps also made some major changes to the way the cards are packaged, but I'll save that for my first real 2017 Topps Now post. Stay tuned!